Dr. Bebe C Pajo is a born perfectionist whose goal is to enhance her patients’ self-esteem. She is a gifted artist who is capable of sculpting a face into near flawlessness by using only her hands and fillers. She has an artist’s eyes that allow her to identify facial flaws and enhance a patient’s beauty while still looking natural. The ecstatic and amazed reactions of her patients after the procedure are testament to her abilities. Although trained in neurosurgery and surgery, Dr. Pajo has always been interested in helping people look their best. Her initial training started in 1998 with Dr. Ted Schiff. 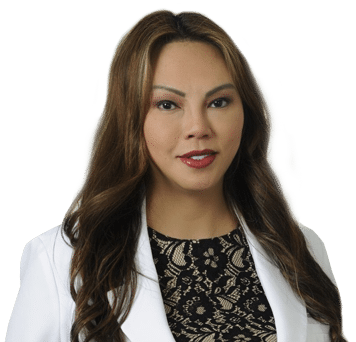 In 2006, Dr. Pajo re-joined Water’s Edge Dermatology, where she trained under Dr. Shino Bay Aguilera, acquiring experience and training in laser medicine, fillers, Botox, and sclerotherapy. She also trained with well-known Miami dermatologists Dr. Mariano Busso and Dr. Oscar Hevia. Dr. Pajo received her medical degree in 1992 from the University of the East Ramon Magsaysay Memorial Medical Center in the Philippines. She then practiced as a general practitioner for a year at the Jane H. Santos Medical Clinic. In the United States, Dr. Pajo trained as a clinical observer in the Department of Medicine / Geriatric Medicine at the Cleveland Clinic Florida, and in 2003 she worked as a house staff physician in the Department of Neurosurgery at King’s County Hospital Center in Brooklyn, New York. She subsequently joined the Department of Surgery at Downstate Medical Center in 2004 as a junior intern, then as a resident physician in general surgery. Dr. Pajo loves to spend time with loved ones and friends, as well as traveling, dancing, watching movies, and shopping.